Team Sky have called five-time Tour de France winner Bernard Hinault "irresponsible and ill-informed" after he urged riders to go on strike if defending champion Chris Froome lines up at the start of this year's race. "The peloton should put its foot down and go on strike saying: 'If he's at the start, we're not starting!'" Hinault told regional newspaper Ouest France. A routine doping test during the 2017 Vuelta a España showed Froome had more than twice the permitted limit of salbutamol - a common asthma treatment - in his system. The rider has said that he took no more than the permitted number of puffs from an inhaler during the stage that preceded the test. Salbutamol is a 'specified' rather than a banned substance, so despite the finding Froome has been allowed to continue racing pending the outcome of the investigation. Hinault compared Froome's case to that of Alberto Contador, who raced in 2011, finishing fifth overall, despite a positive test for another asthma drug, clenbuterol, a year earlier. Contador was later stripped of his 2010 Tour title, along with his 2011 Giro d'Italia crown after being handed a backdated two-year ban. "For me, Christopher Froome shouldn't be at the start of the Tour, simply because he was found positive – for me that's not an abnormal control!" Hinault said. "Contador was sanctioned for the same thing, he got a suspension and he [Froome] mightn't get anything." Team Sky said in a statement: "It is disappointing that Bernard Hinault has, once again, repeated factually incorrect comments about a case he clearly does not understand. "His comments are irresponsible and ill-informed. Chris has not had a positive test, rather an adverse analytical finding for a prescribed asthma medication. As an ex-rider himself, Bernard will appreciate the need for fairness for each and every athlete. And at the current time, Chris is entitled to race." Tour de France director Christian Prudhomme has called for the case to be resolved ahead of the Grand Départ in the Vendée, though UCI president David Lappartient recently conceded that it was unlikely a verdict would be reached before July 7. 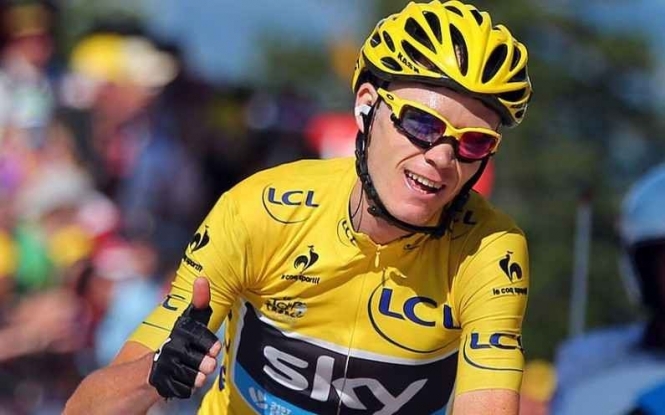 Froome is aiming for a third straight win at the Tour de France. It would be his fifth in total, that would put him alongside Hinault, Eddy Merckx, Jacques Anquetil and Miguel Indurain as the most decorated Tour riders in history.